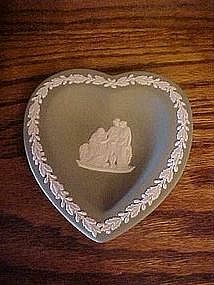 Jasperware trinket box by Wedgwood. 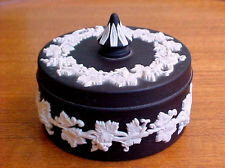 This beautiful box is jet black in color and is in the English Grape pattern, I believe. It measures about 4.5" in diameter and approx. 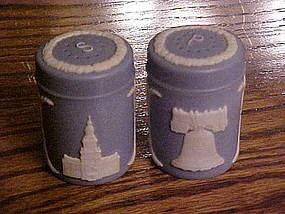 3.75" tall (including the lid.) It is in wonderful used condition with no chips or cracks or flaws. Stamped Wedgewood Made in England 74 (and some other little impressed letters ), GORGEOUS!!! 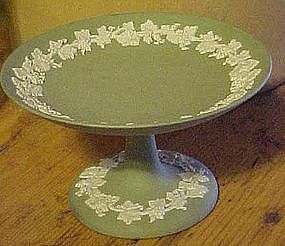 Vintage Wedgewood Jasperware Green Compote Dish RARE. Pretty grapes and leaves relief in white on green. Measures - 3 7/8" tall x 6" across the Top x 3 5/8" base diameter. This item is in MINT condition with NO Chips, cracks, or repairs. 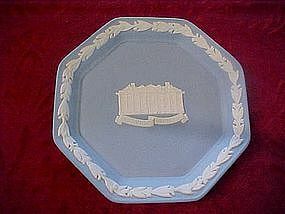 The BAS Relief is in PERFECT condition.Marked MX Wedgewood, Made in England and has numbers also. All marks are pressed into the piece. This little jasperware teapot with lid measures just 2" tall but is in PERFECT condition. Has white laurel trims and a coat of arms that says Felix Towe. Maybe this was a souvenir from the Felix Tower. There is markings imprinted into the bottom but I can't make them out. 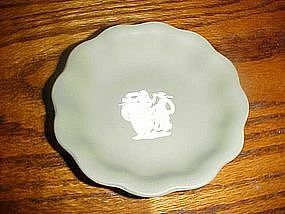 Perhaps this is a real Wedgewood piece, not sure. 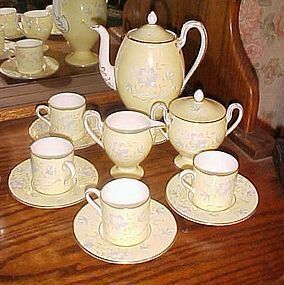 Dated 1957 and Wedgewood marked. 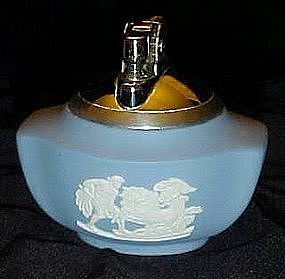 Light blue and white jasperware table lighter. Ronson refillable chrome lighter, Design is an angel driving a chariot and a Roman with an arrow in his hand. Perfect condition. 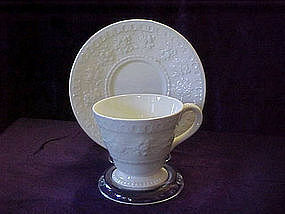 Wedgewood of Etruria & Barlaston, Patrician 2 handle soup bowl or mug. These are hard to find pieces to this set. Cream body with relief pattern of scrolls and flowers. Measures 5 1/4" in diameter plus the two handles. I have a pristine one for 16.50 and the other has a faint 1 3/4" hairline down one side for $10.00. Pretty octagon shape dishes in the Wedgewood blue jasperware. I have two of these that are identical. Each has the center motif of Cowick Hall, and the laurel trim. They measure almost 5" in diameter. On the back is stamped, Wedgewood made in England. Each one is in pristine condition. Price is for each one. 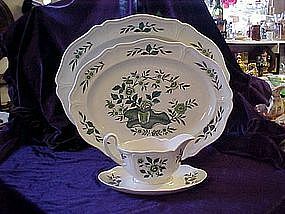 Nice vintage wedgewood heart dish in green with the white laurel border. Not sure of the pattern name in the center. Appears to be a young couple and an elder. Measures approx 4 1/4" by 4 1/2". Perfect condition and stamped with the wedgewood markings. Clearly stamped into the back, Wedgewood, Made in england. 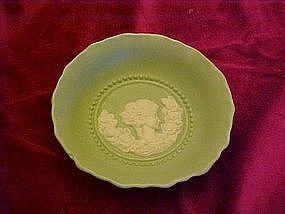 This green jasperware pin dish or mint dish measures about 4 1/4" in diameter. Center design is three dancing ladies. Perfect condition. Pretty covered vanity box has the pegasis design on the top. Measures 3 1/2" across the top of the lid. 1 3/4" deep. 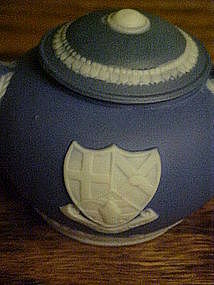 This piece was aquired with other wedgewood jasperware pieces that were marked. This piece is not marked however. You will have to use your own judgement to its authenticity, as I do not have much experience with Wedgewood. It is however in pristine condition and I see no difference myself. 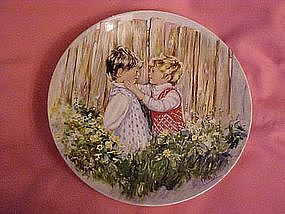 Collectors plate by Wedgewood from the "My memories" collection. A 1981 limited edition crafted in Queen's ware. Limited edition, hand numbered, and in perfect condition. Full size collector plate comes in original box with paperwork and certificate of authenticity. Pretty pale mint green bowl measures 4 3/4" in diameter. It is 1 1/4" deep. 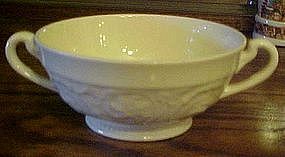 White cameo bust in the center of the bowl. Pie crust edge. Perfect condition. There is a small bubble bust on the edge. You can tell it was from production. This piece is not marked, but the owner insists its wedgewood. Very pretty! 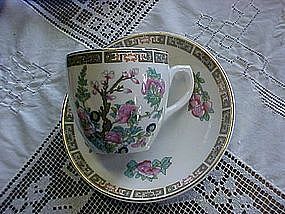 Indian tree pattern on this lovely Wedgewood England demitasse size cup and saucer. Saucer measures 4 3/4" diameter and cup is 2 1/2" tall. Pristine condition. Marked with the unicorn stamp There are 6 of these sets available. Price is for 1 cup with a saucer. All are in perfect condition.Email fpr photo of back stamp. Three of the very hard to find pieces in the Wedgewood green leaf pattern (Queens shape) This shape was designed for Queen Charolette in 1765.Wedgewood Barlaston Made in England. Gravy boat with attatched liner..$60.00... 15 1/2" platter $82.50. And.. hardest to find.. the largest 17 1/2" platter $115.00. All pieces are in pristine condition! Please specify item when ordering. Pure creamy white with raised fruit and floral patterns. Demitasse size. Cup is on a little foot and measures a little over 2 1/2" tall. Saucer is 5 1/4" wide. Actually I believe this is pottery. Excellent condition. 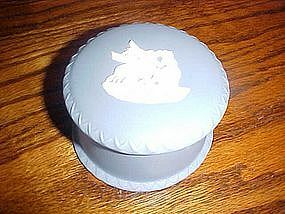 Makers stamp says Wedgewood Wellesley ofetruria & Barlaston Made in England. I believe there are 4 sets availiable. Price is for cup and one saucer. Let me know quanity when ordering. Email me if you would like to view photo of the back stamp.